﻿ Win a £50 voucher to spend at luxury lingerie boutique Coco-Boo, Leigh-on-Sea. Win a £50 voucher to spend at luxury lingerie boutique Coco-Boo, Leigh-on-Sea. 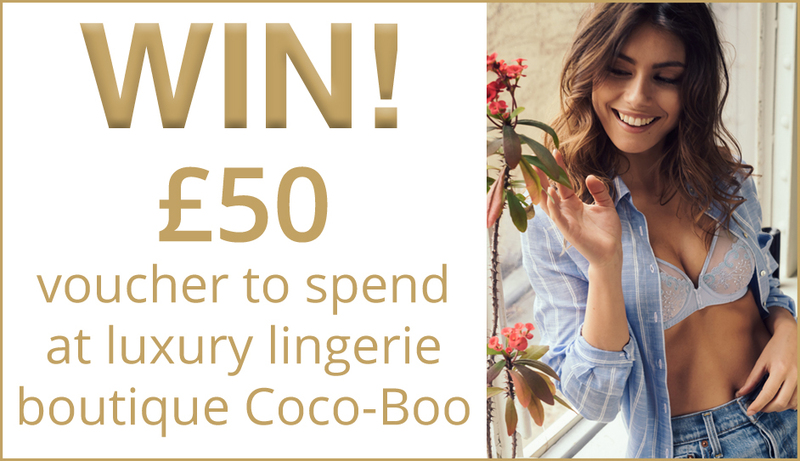 Win a £50 voucher in this month’s Oracle competition by Coco-Boo, a French boudoir inspired, luxury lingerie boutique based in Leigh-on-Sea. Their collections of lingerie, loungewear and swimwear are from an array of highly regarded brands. Please visit their website for further information:- www.coco-boo.co.uk. Your privacy and security are very important to us at Oracle Publications UK Ltd. We will always do everything possible to keep your personal data safe. We collect information about you when you register for our newsletters. We also collect information when you take part in competitions or surveys via our social media pages or website. 1.1 If you use one of our services, or participate in one of our social media surveys, promotions, or competitions, we may ask for additional information, such as your age, contact details and which service you are interested in. 1.2 Some information is automatically collected when you browse our website in the form of cookies. See clause 5 for more information. The data you provide us with will be used for the purposes of the service you requested. 2.1 Any personal data you submit will be retained by Oracle Publications UK Ltd for a period of time which aligns with your requirements, our business need and legal obligations. 2.2 Unless we are obliged or permitted by law to do so, and subject to Clause 3, your data will not be disclosed to third parties. 2.3 All personal data is stored securely in accordance with the principles of the General Data Protection Regulations 2018. 2.4. Contact for market research purposes will only be through email and only to those who have requested this service. Customers may opt out of this service at any time contacting us at Oracle Publications UK Ltd, 11 Clarence Road, Southend-on-Sea, SS1 1AN. Oracle Publications UK Ltd will, from time to time, employ the services of other parties for dealing with matters that may include, but are not limited to, payment handling, search engine facilities, advertising and marketing. The providers of such services may have access to certain personal data provided by users of this website. Any data used by such parties is used only to the extent required by them to perform the services that Oracle Publications UK Ltd requests. Any use for other purposes is strictly prohibited. Furthermore, any data that is processed by third parties must be processed within the terms of this policy and in accordance with the General Data Protection Regulations 2018. We will not share your data with a third party for them to promote their goods or services. 4.1 You have a right to request a copy of the information we hold about you. If you would like a copy please email us info@oraclepublications.co.uk write to us Oracle Publications UK Ltd, 11 Clarence Road, Southend-on-Sea, SS1 1AN. A Cookie is a small file that can be placed on your computer’s hard drive and often contains an anonymous unique identifier and is accessible only by the web site that placed it there, not any other sites. You can choose to enable or disable Cookies in your web browser. By default, your browser will accept Cookies, however this can be altered. For further details please consult the help menu in your browser. a list of URLS starting with a referring site, your activity on this Web Site, and the site you exit to. You will only receive promotional emails from us if you have asked to receive them. If you do not want to receive further emails from us you can click on the “Unsubscribe” link at the bottom of any email communication sent by us. Please allow us 3 business days from when the request was received to complete the removal, as some of our promotions may already be in process before you submitted your request.